The Ladies' Guide to Surviving Anypocalypse: What is courage? You prove yourself every day. 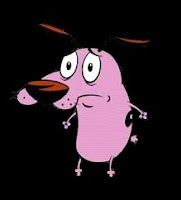 I used to love this cartoon called “Courage the Cowardly Dog.” It was about a little pink-purple dog named Courage who was afraid of his own shadow. Literally: he would yelp and run from his own shadow. An elderly woman, Muriel, found him as a pup and named him Courage because of how he dealt with the lot he’d been given: abandoned with no one to love him he had persevered. The show, while amusing, was not brilliant. However, it did speak to a vital truth: creatures with courage do what is necessary for themselves and their families in the face of danger. No matter what bizarre situation Courage, Muriel, and Eustace were caught up in the dog fought off his fear to save his family. Courage was just a cartoon, but real life versions of him are everywhere. They may not be fending off demonic cats, but that does not demean their courage. Some friends of mine recently lost someone very close to them. She was a surrogate grandmother. She was a close friend. She was a beautiful person. She proved herself to the world every day. Now, the family she adopted mourns her and in doing so prove themselves courageous. They could have retreated into themselves and avoided one another because of the pain sweet memories bring during times of loss. They could, in their grief and distress, have lashed out at one another. They could have chosen to ignore the situation and let someone else take care of the Arrangements. But they did not do any of these things. They are facing their grief together. They lean on each other for support. They are taking care of the memorial and burial of a dear friend. Together they are honoring a woman who showed them time and time again what being a courageous person means. People who are being courageous don't often feel like they are. I think it's just part of the deal.